Stylish, well-equipped, and clever, the Skoda Karoq is another appealing car in the ever-expanding mid-size SUV market. The medium-ish size crossover market is booming at the moment. You’ll find the Nissan Qashqai, Seat Ateca, and the Peugeot 3008 all plying their trade here. If you’re not sure what a medium-ish crossover is, read on. If you are, skip this paragraph. It’s basically a car that combines the best bits of a conventional family hatchback and the off-road-ruggedness of four-wheel drives without any of the drawbacks. If you like the idea of a chunky-looking offroader, complete with high driving position, which is as easy to drive as a smaller car, with the fuel economy to match, then you’re in the right place. So, onto the Karoq. We're confident in saying that it's the best around at the moment. It does everything most people would want, and more. It replaces the Skoda Yeti, a well loved car among its owners. In fact, it recently came in second place in the Auto Express Driver Power survey. So the Karoq has big boots to fill. And it looks big too - primarily because it is. Those familiar with Skoda’s current line up will see that the shape of the Karoq falls much in line with its bigger brother, the Kodiaq. It’s been likened to a little Kodiaq before, and if you went to a showroom and saw them side by side you’d see it yourself. It’s not avant-garde in terms of its looks, but with big wheels and the right colour, it looks every bit as premium as much more expensive cars in this segment. It has some sharp creases towards the rear, but from its side profile you’d be forgiven for thinking it was a Seat Ateca, a car which it shares many mechanical bits with. Let’s get inside though, where it really shines. In the rear there’s room for adults, even if the driver is six foot and the person behind them is a similar height. A 12V plug can be found - the kids can run an iPad or something similar off that. There are even picnic tables - with pull out cup holders. And yet more cup holders appear if you pull down the centre seat. Speaking of seats, our test car has Varioflex seating. These come with the mid (SE L) and top spec (Edition) as standard, and can be specified on the SE cars too. With this, all three seats are individual. This means that they can slide individually, and all three seats can recline individually too. Further back, the boot has lots of nice little touches. There is netting to tie things down, hooks to, well hook things on, and another 12 volt socket. Those Varioflex seats mean that the seats fold in half, or fold upwards, or can be taken out entirely. This level of flexibility makes it class leading. With the seats out, what you’re looking at here is a luxurious van - copy of The Sun sold separately. Up front, it’s also spacious and functional. Overall quality is good, and dare we say it, almost-posh. The touchscreen (9.5in) in our test car is responsive and easy to use, and can link with Android and Apple phones. Another nice touch is the addition of a little rubbish bin inside of the door bin of the drivers’ side. Just enough storage for a few apple cores or chicken wings or other greasy goodies you don’t want actually touching the interior. Point your eyes slightly to the left of that door bin, and on posh models, you’ll find the starter button. Press that, and off you go. The car is incredibly easy to drive and to get accustomed to. Manual cars have a light clutch and a six-speed manual that won’t cause any headaches. Our test car had the DSG automatic gearbox fitted, which made it easier to drive still. Gear changes are so smooth that you might not notice them. The automatic can be ever so slightly hesitant while accelerating away quickly though. Ride quality is very high. It’s smoother than the similar Seat Ateca and at motorway speeds, it is able to waft with the best of them in this sector. The ride at slower speeds is good too - although large potholes and the likes often found on British roads are not a subtle affair. Hit one and it can be harsher for occupants than you’d like. This is because only the four-wheel drive version is fitted with fully independent rear suspension. You probably won’t be able to tell in day to day, but you can tell on really bad roads. If you want that four-wheel drive system, which makes the car grip and drive better on muddy and generally bad surfaces, you’ll have to stump up for the 2.0 litre diesel. Generally, the 1.0-litre petrol is best for people who do mostly town journeys. The 1.5-litre petrol is more expensive and a bit less economical than the 1.0-litre, but is much faster and better at longer journeys. The engine noise is very harsh in the cabin when you encroach on 6,000rpm for both of these. But apart from that, both of these are good choices. The 1.6-litre diesel is the most economical, and the 2.0-litre diesel is fast and frugal. The Karoq is every bit the five-seater Kodiaq that Skoda wants it to be, and with the right specification, is a class-leading crossover. Put simply, it’s understated, comfortable and clever. It’s the cheapest to buy, plus, thanks to cylinder deactivation, where part of the engine shuts down if it’s not required, it can do a claimed 52.3 mpg, although real world testing puts it at more like 43.1mpg. SE L models come with a good standard of equipment. Large and punchy diesel engine is enough to take a family of five and their luggage without being strained. Edition spec has panoramic sunroof to keep the kids entertained, plus clever foot operated boot for when your hands are full. The peppy 1.5-litre engine is the sportiest-feeling Karoq available. Its 0-62mph time of 8.1 seconds is certainly respectable in its class, although not stunning. Get the DSG automatic gearbox, put it into sport, and use the paddles on the steering column to change gear like Lewis Hamilton. The lowest powered-diesel engine teamed with the least standard spec trim level does make this a bit dreary. The diesel is a bit weedy. Team this with a tediously-dull silver and it does make the car dishwater dreary. 2018: Emergency Call button becomes standard equipment. The engine’s size is one point five in litres (here it’s 1.5) and the letters indicate that it’s petrol powered. Diesel engined Karoqs will say TDI here. Buyers have the choice of a six-speed manual or seven-speed automatic transmission. DSG denotes that it is an automatic. The trim level indicates the standard and quantity of equipment. For the Karoq, SE is he most basic, SE L is the mid range, and Edition is the most luxurious. There are four engines for the Karoq - two diesels and two petrols. The first petrol is a 1.0-litre three-cylinder affair called the 1.0 TSI. It produces 113bhp and is about enough for town driving. It gets to 62mph in 10.3 seconds, which is about where everything else is for the sector. However, it can feel strained at motorway speeds when it’s full of people and luggage. Real world fuel economy is around 43.1 mpg, which is pretty good. We’d recommend this for people who infrequently have to do much more else than town driving. The bigger and faster 1.5 TSI is our favourite of the choices, and the one that we’ve spent the most time in. 62 mph comes up in 8.1 seconds, meaning it’s more than adequate at joining a motorway at an appropriate 60mph. It’s also pretty good at getting past small moving traffic on country lanes. It has a much larger power band - meaning it’s quicker at fewer revs than the smaller engined car. Skoda says that you should expect economy of around 51.4mpg, although we found it to be more like 40mpg. The diesel options should be much more frugal. The 1.6 TDI returns up to 49.23mpg in terms of real world figures. This makes do with 113bhp, similar to the smaller of the petrol engines. However, because of its diesel nature, it feels eager from fewer revs and it doesn’t feel quite as lethargic. The downside is that it is louder than the petrol cars. The 2.0 TDI engine has 148bhp and is punchy at overtaking in short distances. This is the preferred choice if you’ll be hauling things too. MPG is still better than the petrols, but becuase of its four-wheel-drive system, it’ll bring MPG down to 43.2. Less than the smaller engine, but still respectable for an SUV of this type. Skoda is known for its generous equipment levels from standard, and the Karoq is no different. It comes in three flavours, SE is the cheapest, SE L is the mid-specification, and the highest-spec on offer is the Edition. Another thing that Skoda is known for is the amount of connectivity in their cars. Even in SE spec you get Smartlink to connect your phone with Apple CarPlay and Android Auto - meaning you can use your phone’s sat-nav. Cruise Control, DAB radio, autonomous emergency braking and rear parking sensors are also included with this. 17-inch alloy wheels, electrically adjustable, folding and heated door mirrors with autodimming, front fog lights, halogen headlights, privacy glass, black roof rails, also come with this spec level. SE L models come with an inbuilt Skoda sat-nav, and eight-inch touchscreen and integrated wi-fi. The touchscreen is intuitive and easy to use - the sat nav less so. It’s a good system, just not as polished or as easy to understand as Google Maps. This also brings in keyless entry - meaning the car can sense the key is near it and will let you in. It also has keyless ignition - meaning you don’t need to put a key in an ignition to start it. There’s just a button you need to press. These are both aimed at making your life easier - hopefully it’ll get rid of the dreaded hunt for keys in bags. Top spec Karoq Edition models come with an upgraded sat-nav, voice and gesture control, and wireless phone charging. They also come with a panoramic sunroof - meaning there’s a large piece of glass above you. Great for letting light in and making the inside seem even bigger. One useful feature that can be specced is the electrically operated tailgate. There’s a ‘virtual pedal’ underneath the rear bumper. You activate this with your foot and it opens the tailgate if your hands are full. There’s also a button on the inside of the tailgate that will close it for you. 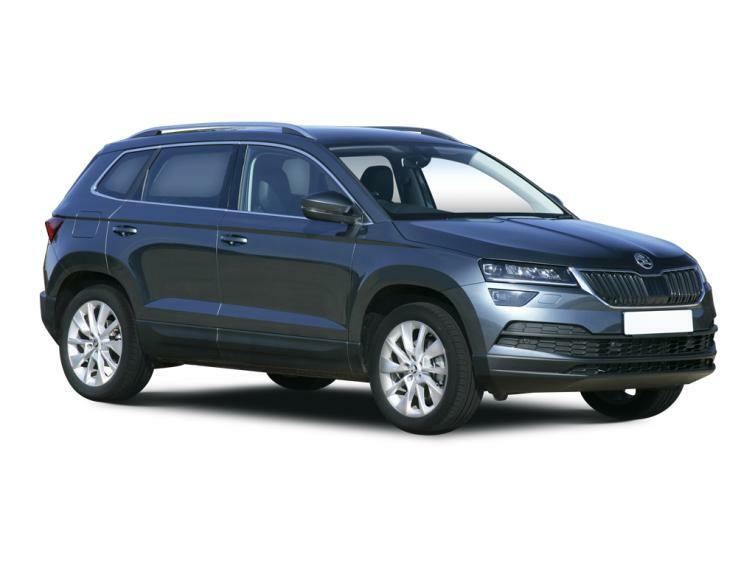 The Karoq is too new to be included in the Auto Express Driver Power survey, however, Skoda’s other cars have performed amicably in the owner satisfaction survey. Last year, the Skoda Superb and the Skoda Yeti came first and second respectively in the survey. And Skoda finished second overall the manufacturers’ charts, only behind luxury car maker Lexus. The Karoq comes with a three-year/60,000 mile warranty as standard. This might seem like a lot, but rivals from Hyundai offer a seven year warranty, and Kia offers a five year warranty. It’s also important to remember that if you’re thinking of buying the car outright, that it has lots and lots of tech in it. Great now, but ultimately more to go wrong when the warranty runs out. Skoda does sell additional warranties however. As the Karoq has been available for less than a year, there aren’t a huge number of cars on the market. But, this does mean that there some pre-registered, and therefore virtually nearly new bargains. Expect big discounts on the most expensive cars - e.g. Executive models with the 1.5TSI petrol or the 2.0TDI diesel. We’ve seen some 2.0TDI diesels, with four-wheel drive with around £3,500 off the list price. Skoda's Karoq is aimed at the mid-size SUV market, and starts at £20,875. Although higher-spec models are more like £28,000. It replaces the much-loved Skoda Yeti, although it is bigger and more practical than the Yeti in nearly every respect. Rear end styling of the Karoq is best described as neat - but it does have some interesting tech. You can specify a foot operated boot for when your hands are full. The interior is much plusher than some would expect from a Skoda. Alacantara (a man made suede) is found in top spec cars, and there are nice little touches throughout. For example, wireless charging for your mobile can be specified, and there's a little bin within the cabin, just big enough for greasy snacks you don't want staining the interior. Connectivity is high up on Skoda's agenda. You can get Apple CarPlay and Android Auto - allowing you to access certain apps via the car's touchscreen. Rear seating is clever, and spacious. There's enough room in the back for a six footer, even if a fellow six footer is driving or a passenger. Varioflex seating means that all three rear seats are indendent. They can be moved into different positions individually, or removed entirely.